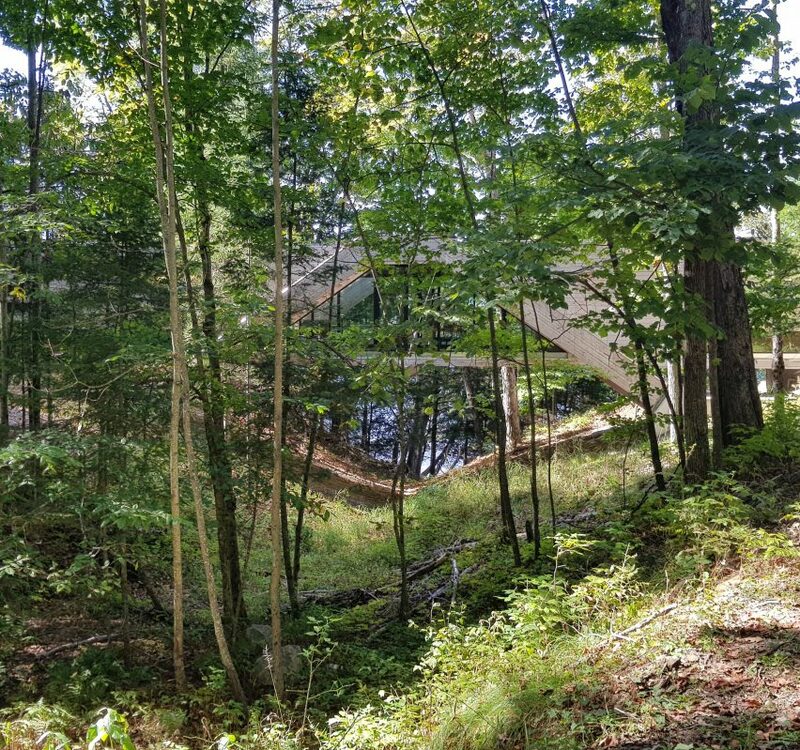 Peruvian architecture firm Llama Urban Design has built a wooden house that connects two sides of a tree-covered valley in Ontario, forming a bridge over the ravine below. 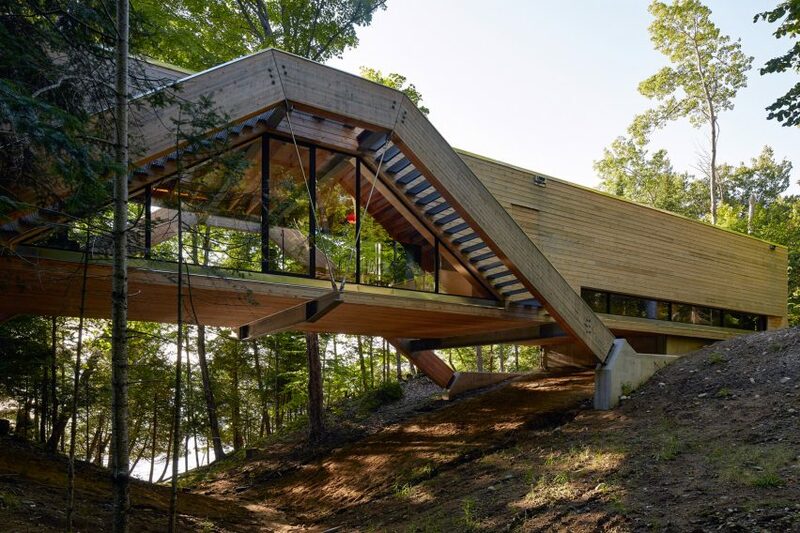 Bridgehouse is nestled in between two large mounds of earth, suspended above the forest floor. Its main structure is formed from Glulam engineered timber, with two large beams on either side of the house spanning across the small valley, and anchored by concrete pads. 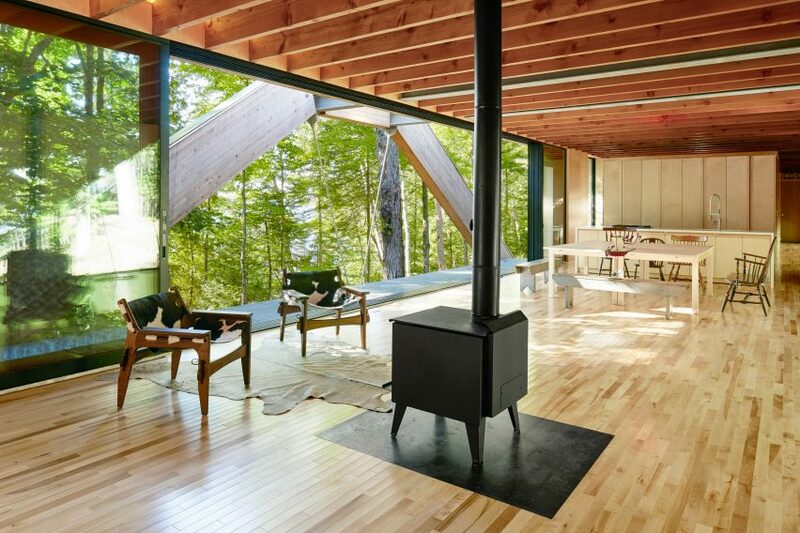 A wooden floor is supported between the beams, creating a trapezoid shape in elevation and a bridge across the gorge. 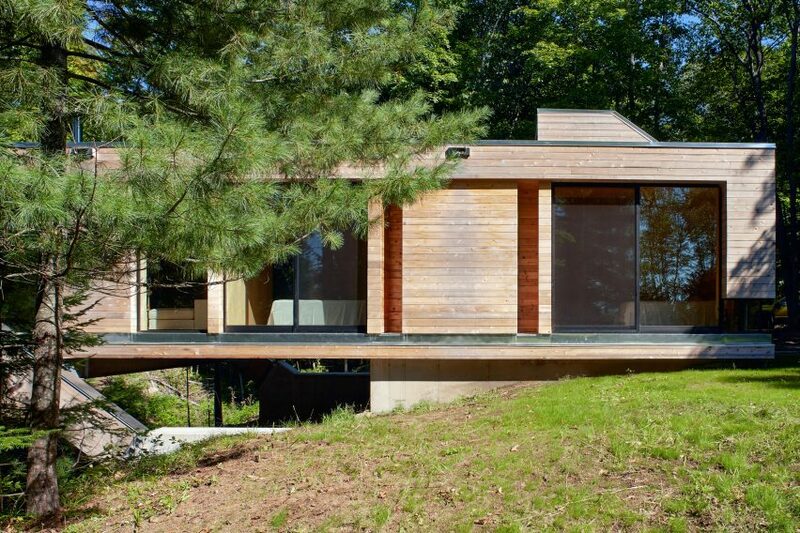 On top, unstained cedar boards provide cladding for walls and the roof of the long narrow home, measuring 2,476 square feet (230 square metres). Of the two main facades, one side is almost fully glazed and opens onto a balcony that looks towards a lake. 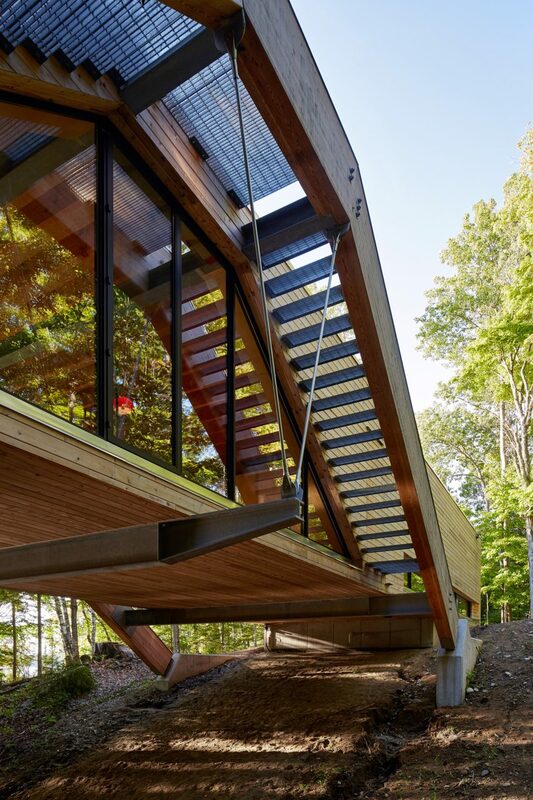 On the other, glazing fills the gaps between the Glulam structure and the floor, and provides views of the forest beyond. External metal staircases climb up the sides of the angled beams, leading to a roof deck. Access to the home is possible at each end, where mirrored layouts include a bedroom, a detached bathroom, and a separate smaller room. An open-plan kitchen and living room serve as the core of the house, with a centred fireplace and minimal furnishings. 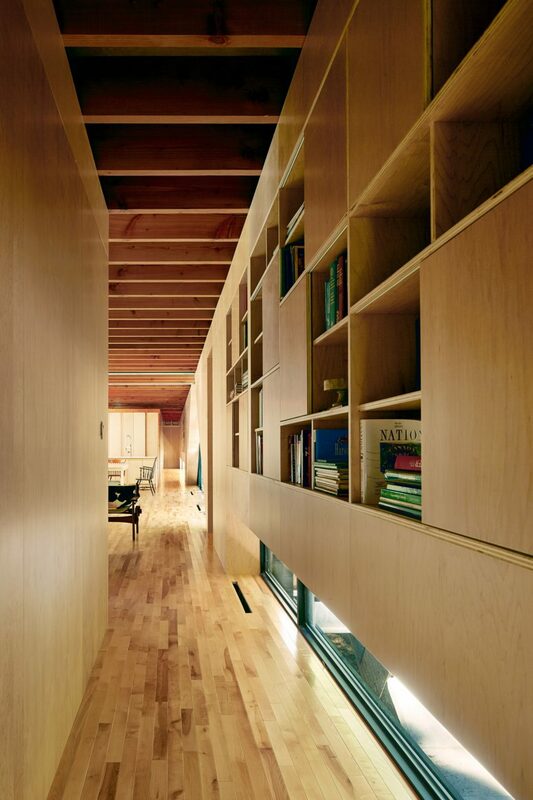 A long hallway runs along the forest-facing side to link the spaces together. A light wood shelving and cabinetry unit provides storage for the minimal interior. 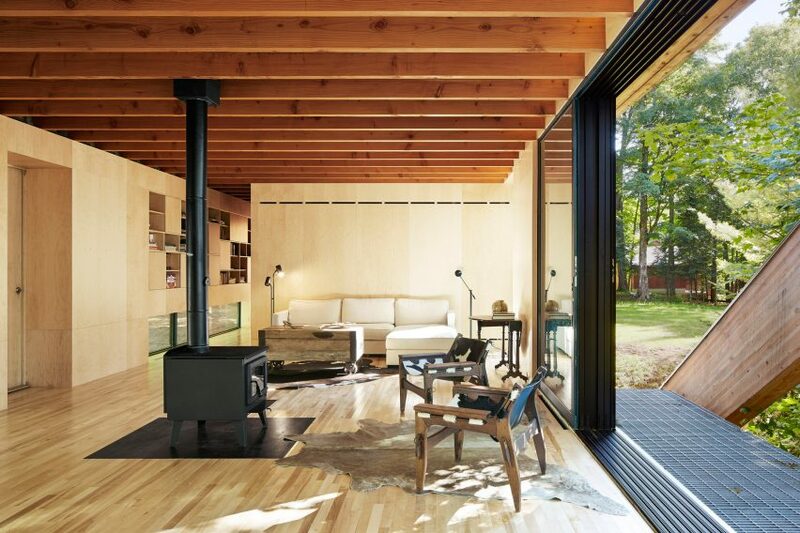 Large panels of maple plywood cover the walls and floors inside. 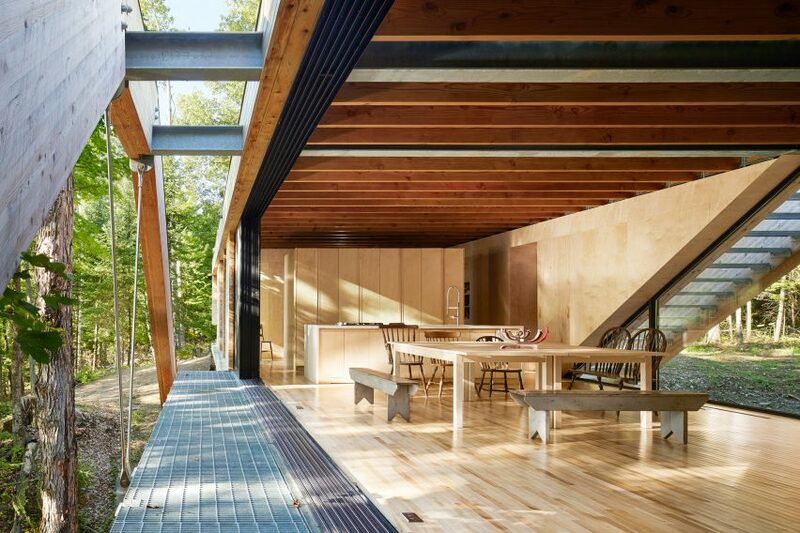 The entire construction uses only local woods, and the project was awarded first prize at the Ontario Wood Design Awards 2016. Photography is by Ben Rahn, A-Frame studio.